Let’s be honest: There is a vast, left-wing, cinematic conspiracy against the Bomb. How many monsters resulting from the evils of nuclear testing were created to scare the bejeezus out of the movie-going public? Google and Wikipedia can give you a head start on compiling this list. The ACW reader who goes the extra mile and comes up with the longest list of bomb-related cinematic creatures will receive the usual prize: a personally inscribed and autographed copy of one of my remaindered books. Scant compensation, I know. An ACW coffee mug would be better. The winner, with accompanying list, will be announced at year’s end. The first “Nuclear Monster” movie was directed by a Frenchman who’s first film experience was working on the anti-communist film Black Crowes. Does that sound like a left winger to you? Are you attempting sarcasm or do you genuinely believe the left is solely responsible for sci-fi nuclear monsters? This one, starring our grandson, doesn’t count. How many iterations of Godzilla can count? You are only allowed to count Godzilla once. But if Godzilla’s over-sized friends are also nuclear mutants, you are allowed to pad your count. Oh no, there goes Tokyo, Godzilla. How many of the Peter Sellers characters in “Dr. Strangelove” count as monsters?…? Now that’s a great excursion. One of the many things I love about this movie is the juxtaposition of deadpan crazy with over-the-top crazy. Sellers as President Merkin Muffley playing off against George C. Scott’s Gen. ‘Buck’ Turgidson? Classic. And if you put Sterling Hayden in the cockpit of that B-52 instead of Slim Pickens, the movie would have trailed off badly. But the scene that keeps replaying in my mind is Keenan Wynn’s Col. ‘Bat’ Guano, protecting government property in the form of a soft drink machine, when spare change could save the planet. I suppose the real monsters don’t count: megaton monster, missile monster, MAD monster, etc. I recall more vividly the science fiction portrayal of nuclear war, whether intended as a warning, or just a plot device to get some other story started. Godzilla was always a fantasy monster, not obviously nuclear related. The real nuclear monsters may be asleep for now, but they could awaken at any moment. The method for determining the winner is not entirely clear. If you want early publication, only the first to publish a given monster should count. If you count only the longest list (even if it duplicates prior entries), then everyone should wait until December 31 to publish, to avoid copying by others. Either way, the best list will combine the suggestions of two or more list makers. I’ll hold on to all entries and publish only the longest list. By ishiro honda.. The cinematics are great for ’56 along side the numerous creatures that get released as result of nuclear testing. “Godzilla” is an American iteration. 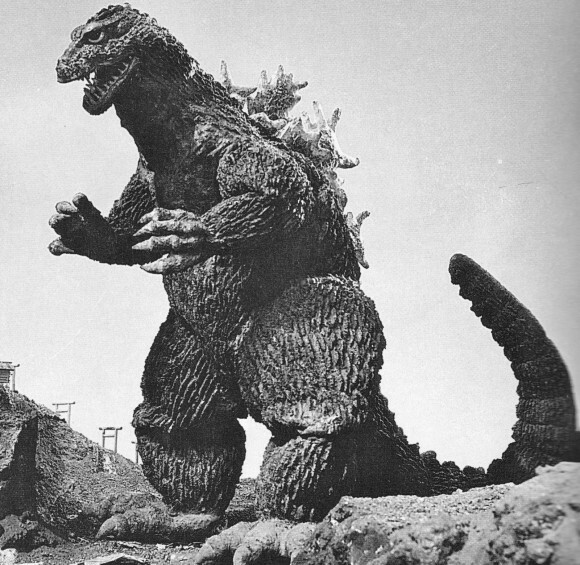 More purely anti-nuclear was Gojira, the Japanese original. I love attention to detail. And who could forget 1954s THEM! Also do monsters created by exposure to radioactivity/nuclear waste count? For sure: radioactivity and nuclear waste count.